This isn’t the usual blog for Acarda however recently I have had several non-technical-but-computer-savvy people ask about website creation options. Their goal, to get a web site up and running quickly without paying a fortune for design or hosting. One option is to use a free template design for your website. 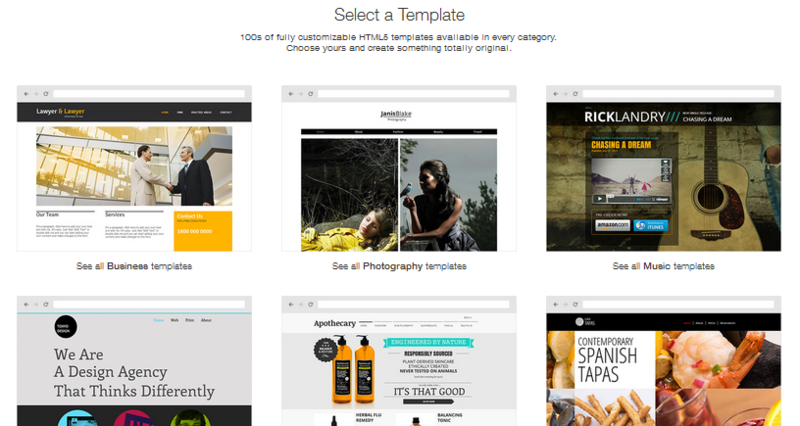 There are often 100’s of free templates to select from so it’s an easy way to get start without paying for a website developer to build you anything. Usually these service providers require you to host your website with them and if there is a free plan expect to find adverting added by the provider to your site. One example of this is WIX.com (www.wix.com). They have loads of beautiful pre-designed templates you can use. It’s a fast way to get a web presence. You must host these template websites with them and their plans start at $4.08/month (displays Wix Brand Ads) or $8.25 for their Combo plan without ads. They have other options which give greater storage and bandwidth however the Combo plan should be enough for small sites. Another example is GoDaddy (www.godaddy.com/websites/website-builder). They have several plans, a Personal which is just $1/month but only has access to 50 personal themes, and a business plan which is $6.99/month and you select one of 300 templates. WordPress themes are everywhere so using a WordPress website is another option to consider. Again GoDaddy (www.godaddy.com/hosting/wordpress-hosting) provides these. Their Starter plan is good for basic websites and blogs at only $1/month (when on sale). 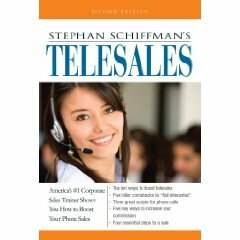 They have a Business plan for $9.99/month. These plans give you access to 1000s of themes and plugins. Of course you could use WordPress.com https://wordpress.com/ where you can create a subname of your choice e.g. howtocreateawebsitequick.wordpress.com on their free Basic plan (may show ads) or pay $99/year to have basic themes and no ads with your own full domain name (https://store.wordpress.com/plans/). 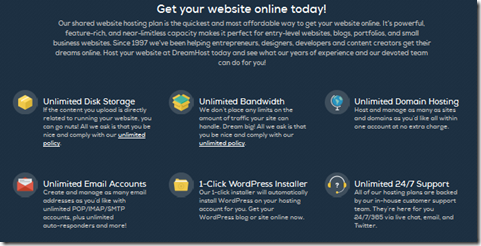 You could set up a hosting plan with someone like Dreamhost (www.dreamhost.com) . 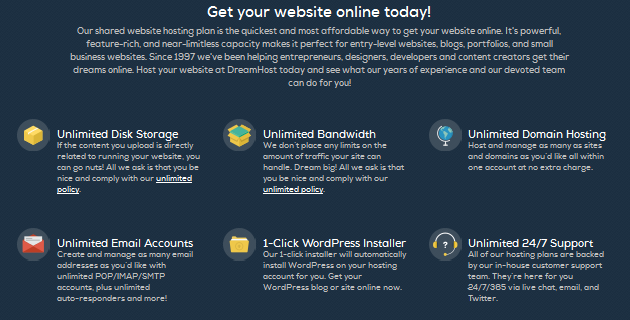 They offer a WordPress Hosting plan (www.dreamhost.com/hosting/wordpress/) for $19.95/month and you have access to a huge number of templates for your website. It’s worth considering just using a normal blog for your website and adding a few static pages to the blog. This requires a bit more technical known-how but is only $8.85/month and you can host unlimited number of domains, unlimited all-sorts of stuff including a 1-Click WordPress Installer with access to the many WordPress themes. If you have some technical ability then this is certainly an option to consider. Another WordPress hosting site to consider is bluehost (www.bluehost.com/products/wordpress-hosting) who have plans starting on special offers at just $3.95/month. For larger and higher traffic sites look at their Optimized Hosting for WordPress plan at $24.99/month (//www.bluehost.com/products/wordpress-hosting) For a helpful beginner’s guide for WordPress take a look at www.wpbeginner.com. Once you have signed up you can access WordPress Video Tutorials. There are other website creation and design tools that you can use to build websites quickly such as Weebly (www.weebly.com/features) and Joomla (www.joomla.org). 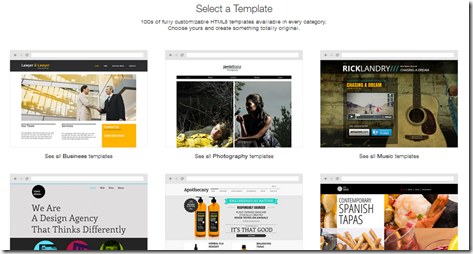 Weebly is a web-hosting service that allows you to “drag-and-drop” with their website builder to create a website. Joomla is a free and open-source content management system for publishing and managing web content. Many website hosting services, including the above mentioned bluehost (www.bluehost.com/cgi-bin/signup) and dreamhost can host sites designed with these tools. If you are looking for an educational website with WordPress video tutorials and other web development resources you may like to look at FirstSiteGuide. With the likes of Weebly, Joomla or WordPress you should be able to get your website up quickly and have a lot of fun while you do it. The hardest part isn’t so much developing the site but rather working out the right content to present.